How to Maintenance your Blowout / Silk Press: 5 Tips for Wrapping and Protecting Your Hair Start your wrap with your fingers and work your hair in a circular motion TIP 1. Use a silk bonnet or a wrap to secure your hair in place TIP 2. When taking your wrap off, comb your hair down. If your hair cut allows for it, switch the direction in which you comb or brush your hair out every couple of days. If your hair is dense or really long, I recommend using a paddle brush. TIP 3. A silicone-free finishing serum is a great way to seal in moisture and maintain your style. Use a half or full pump and gently rub into your hands. Add to the ends and into the base at different places. The serum adds a really nice finish and gives a really nice shine; reflective when you unwrap your hair and providing a finished look. TIP 5. Use pins if your hair is falling in the wrap and not holding. TIP 4. 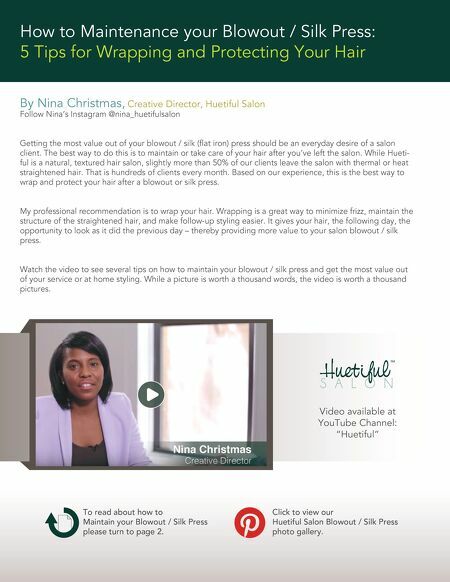 Now you can enjoy your Huetiful Salon blowout / silk press or your at home hair care and get the most value out of your styling.